Stress fractures and stress reactions occur in a large amount of the athletic population and there are some very common training errors that cause them. Find out what a bone stress injury is, what causes them and some easy training tips to help prevent them. A stress fracture, as the name suggests, is a small crack in any of the weight-bearing bones of the body. Stress fractures occur in bones that become mechanically fatigued or overloaded. This means that they are getting repetitive loading through them that is more than they can handle. This creates an imbalance between bone resorption and bone formation – basically it is breaking down faster than it is being built! At the stage where this overloading is beginning and the imbalance is in the early stages, this is called a stress reaction where there is inflammation in the bone and a microscopic crack, but no fracture yet – Ideally this is where we would like to stop them, before they get any worse. If this microscopic crack is not able to heal, ignored as an annoying niggle or not properly managed and is subjected to further loading, the microdamage will increase and the crack will enlarge. This increase in damage can cause the bone to break on a macroscopic level = Stress fracture. Runners can get a wide variety of stress fractures, but the most common bones are the shin bone, the metatarsals (long bones in the foot), the femur, the fibula(outside of the calf) and the navicular. Activities of impact with repetitive loading such as marching and running are associated with stress fractures. About 50% of stress fractures take place in the shin; however, a stress fracture can occur in any bone. 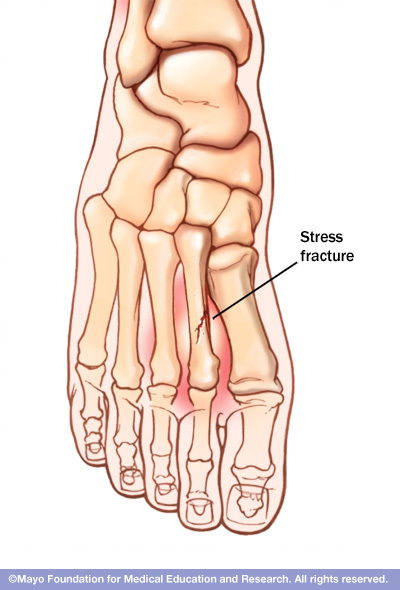 The foot, especially the second metatarsal, is another common place for stress fractures. It is estimated that a massive 15-20% of overuse injuries are stress fractures. This is a massive amount of you runners and so it is crucial that we do all we can to prevent them from happening and IF they do happen, catch them as early as possible for best results. Sleep deprivation, and collagen anomalies. The most significant of these is at the very top. Runners are particularly at risk of stress fractures due to the repetitive nature of the sport – often running on hard surface for a large proportion of training and doing the same, repetitive loading through their limbs thousands of times – every time you go running. It isn’t like football or tennis where you go sideways, backwards and cut and jump – it is all forward, forward and sometimes hop over a rock or root or turn a corner. Bone, like the rest of the body really, adapts to the forces put through it and becomes stronger. BUT, unlike muscles which can strengthen within days or weeks, it can take months for bone to get stronger and it has been triggered to get stronger (by being put under a increased level of stress/training load). There is actually a period of about a month where the bone becomes weaker after an increase in training. This is because of the way bone gets stronger, it first has to take down the old walls before it puts up new ones – like renovating your house. This all means that if you increase your training load too fast for your body, there will be too much breakdown of bone, not enough build-up and a fracture can form. I don’t want to get too complicated and blast you with too much information – but it is better to be informed right? From a biomechanical viewpoint stress fractures can occur because of tired muscles or a lack of muscular control. The muscles then not being able to control your legs and the impact transferred through them when running, can cause excess force to be put through the bones. As well as this, there are a number of things such as excessive hip rotation, over-pronated feet or ankle and leg length discrepancy that may increase an athlete’s risk for stress fractures. To find any asymmetries or deficits in your training program, get a musculoskeletal screen and have your training checked by a professional. A RunFx assessment is ideal for this. Train smart – Build up your running load safely. Have a read through this great post for some great tips and golden rules for runners. Don’t ignore pain. 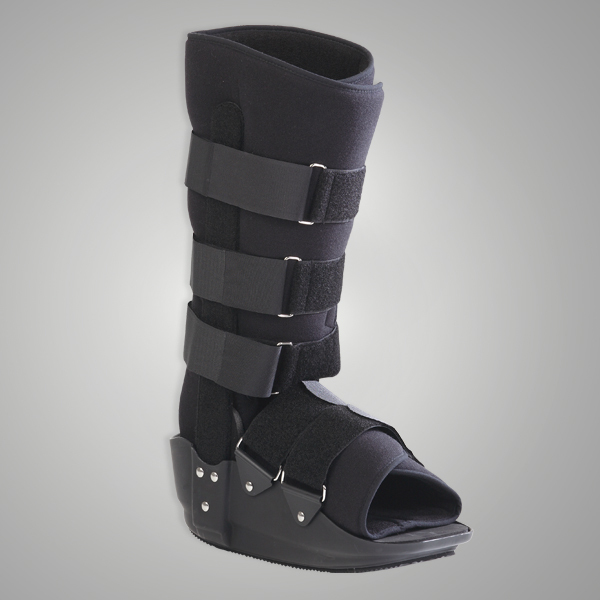 If you are getting any aching, burning or pain around any of the bones in your foot or shin then get it checked out – it is much better to be safe than sorry, as I would rather not have to put you in a moon boot!